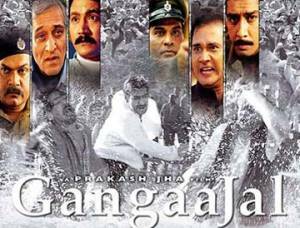 Despite the disclaimer at the start of the film, Gangaajal is based on a true incident and aspires to delve into the moral dilemmas thrown up in the face of mass corruption which pervades every layer of society in India.. Jhaâ€™s film follows a familiar setting of one of his previous efforts Mrityudand which although dealing with womenâ€™s emancipation, also concerned a small time village where corruption, moral decay and hypocrisy breathed from in every pore of society. Jha has made a mesmerizing film, devoid of frills and clichÃ©s, taking a straight and narrow path in the narrative and concentrating on the issues that face the character of Amit. It is a film of great power and does ask you some pertinent questions before reaching a climax which may seem perfunctory but actually decides the issue on the correct moral grounds. Stark and mesmerizing, Jha knits together a frightening expose of corruption in Tejpur which simply acts as a metaphor for corruption which is so embedded in our society. Ajay Devgan is simply superb yet again in a controlled and riveting performance as the upright Amit. Gracy Singh has a blink and you will miss her role but the film sticks to a gripping narrative and does not seek to deviate from this purpose. Mukesh Tiwari is excellent in the role of Bachcha Yadav and both Mohan Joshi and Yashpal Sharma enact their roles extremely well. Shot in Bihar, Gangaajal has the feeling of authenticity to it and aspires to be more than your usual cop against the system film. This subject has been dealt with so many times before, but rarely so effectively as Jha manages to do here. For the meek, it is perhaps not to be recommended but otherwise, a stunning film.